Diana Dyer, MS, RD: Orioles arrive at the wrong address! Something new to learn every day! First Fawn Born on the Farm! Orioles arrive at the wrong address! Thanks to all my polite friends! Spring has finally and really (again, finally!) arrived in SE Michigan. It is late, late, late, but when the Baltimore orioles show up, the train has finally made it up to speed and is not going to stop again! While working outside today at our 'city house' trimming out dead shrubbery branches (seen because the leaves have finally! 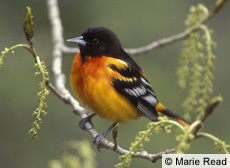 emerged), scrubbing dirt off of the front porch walls, the doors, the worst part of our house siding (it's now 'good enough'), and even the gate leading from our yard to the park behind our home, I heard the happy whistling and churring sounds from the strikingly handsome Baltimore oriole. Better yet, when I looked up to see it high in our silver maple tree, there was not one but three males chowing down on the trees' flower buds, which have also finally come out! I had to tell them that I was happy to see them, but the feast I always have waiting for them (grape jelly and oranges) had been moved out to the farm this year. They didn't seem too upset since there was an ample supply of natural food in the yard for them, but I do hope they listened to my invitation and directions. At least they don't have to worry that Mapquest/GPS systems do not work for our address! The first thing I did when getting back to the farm was to make sure the jelly had not been eaten/disturbed by anyone else (nope!). Now the banquet is ready. I hope they (or their friends and relations) arrive. I'm ready for them at the farm! There is a great quote by Aldo Leopold (author of the classic book A Sand County Almanac and also the subject of a new documentary making the rounds called Green Fire) that relates to the month of June, but I like to paraphrase it to the month of May as I think about all the birds both migrating through and arriving to find a home and a mate. “In June as many as a dozen species may burst their buds on a single day. At this point now, with the spring migration train finally up to full speed, I will not be able to stay abreast of all the arriving birds! I will not see them all, however I hear about them through posts on a birding listerv for SE Michigan, my eyes and ears to what is happening around me that I miss. It does not matter if it is birds, flowers, butterflies, or baseball teams, spring is different and contains an arrival, a special event, or an anniversary of some type for everyone that cannot be ignored. Ah....... Spring! What is yours? And such a handsome bird. I can easily imagine you talking to them. How sweet. I was talking to the robins the other day at the community garden plot :-). Happy Spring to you. I'm so glad the train is on a roll. I hope it arrives soon up here, too. As for a special spring event -- well, I'm waiting for a full day of warm sunshine.